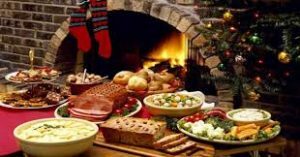 In the past, Christmas is celebrated in a solemn way, by fasting with first six weeks before Christmas and feasting on pork on the day of Christmas Eve. After the feast, one favorite activity for the children is staying up all night and wearing various animal costumes while singing Christmas carols. People would offer the children refreshments and drinks as a reward for their singing. In addition, the costumes also disguise the children when they pull pranks on their neighbor, usually because their neighbor is not generous with their offering of refreshments. According to certain sources, girls would read their fortunes on candle wax, mirrors, or tea leaves. They try to guess who their Mr. Right (destined husband) was, what he would look like, when he will appear in the girl’s life, and if the marriage would be a happy one. In the wake of revolution, Communism rose to power, and as a result most religious celebrations are banned due to the state-mandated atheism. The people could pray at the safety of their homes, but any open religious celebration is a subject to the prying eyes of the Communist Party. Thus, they have to disguise their celebration and identify as atheists to the state. Due to the “New Year” assimilation of certain aspects of Christmas, such as the tree and the gift-gifting, some opted to disguise their Christmas celebration as New Year celebration, with some calling Christmas trees “New Year” trees. Nearly 80 years later, the Communist fell, and more people turned back to religion, the most common being Russian Orthodox. Families commonly feast on the same bowl of “kutya” to symbolize unity in addition to sochivo’s symbolism of happiness, prosperity, and untroubled rest. After the feast, the family shares the Lenten bread. The bread is first dipped in honey and garlic before eaten. The bread symbolizes the body of Jesus similar to the “Holy Feast” mentioned in the bible, while the honey and garlic symbolizes the sweet and bitter aspect of life combined. After the three hour feast, the dishes are often left unwashed, while the family attends a solemn service in the Orthodox Church. The duration of the service varies, finishing at midnight or even at 4-5 in the morning. Russia has a rich culture, and the integration of cultural symbolism such as the meanings of certain foods only proves that religion has existed alongside Russian culture for centuries, as the religious celebrations simply came back after the enforced atheism has been lifted. From the arrangement of the table to the served foods, all contain a mix of religious values and local values. The meanings of the food items from the local culture combined with the story of 12 Apostles from the bible fused to create the celebration currently known. The first step to learning any culture is the language. For guides on how to learn Russian effectively, check Tips on How to Learn Russian Effectively, Easy Russian for Beginners, Getting Closer to Russian Language with Music, and 150 Words for Beginners.